This zip-up style hoodie is a heavy weight (10.5oz.) cotton/polyester blend. The 5 sizes (S-M-L-XL-2XL) come in black or gray. This graphic is the head of a Service Dog with the text “Service Dog” above and along the side. Below the graphic is the text “Loyal Dedication”. We have digitalized other great photos of dogs in the Service Dog and Therapy Dog field that can be used with this hoodie. The embroidery is done with durable, high sheen, polyester threads. The graphic will go on the front, top right. We will adjust the colors in the graphic based on the color of the hoodie. In other words, if you buy a black hoodie, we will do the outline in a lighter shade to better display the graphic. Down the left arm, the text “Service Dog” or “Therapy Dog” is embroidered to correspond to the graphic selected. We will personalize your name on the top, left side FREE of charge. If you want a particular color for the text or color for your name, please add that information in the comment box upon check out. 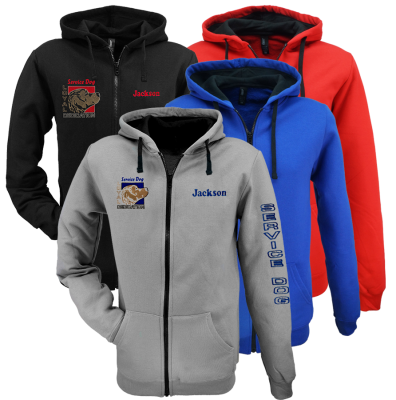 If not specified, we will choose a color that corresponds best with the graphic and hoodie color.